Preventive detention as a counter-terrorism tool is fraught with conceptual and procedural problems and risks of misuse, excess and abuse. Many have debated the inadequacies of the current legal frameworks for detention, and the need for finding the most appropriate legal model to govern detention of terror suspects that might serve as a global paradigm. 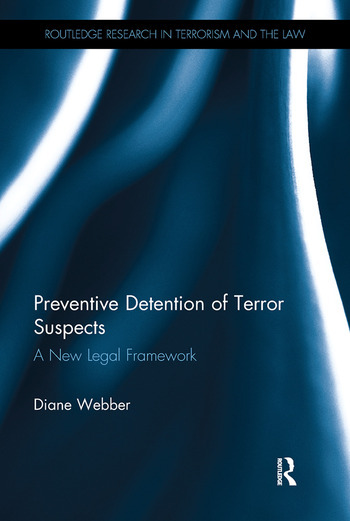 This book offers a comprehensive and critical analysis of the detention of terror suspects under domestic criminal law, the law of armed conflict and international human rights law. The book looks comparatively at the law in a number of key jurisdictions including the USA, the UK, Israel, France, India, Australia and Canada and in turn compares this to preventive detention under the law of armed conflict and various human rights treaties. The book demonstrates that the procedures governing the use of preventive detention are deficient in each framework and that these deficiencies often have an adverse and serious impact on the human rights of detainees, thereby delegitimizing the use of preventive detention. Based on her investigation Diane Webber puts forward a new approach to preventive detention, setting out ten key minimum criteria drawn from international human rights principles and best practices from domestic laws. The minimum criteria are designed to cure the current flaws and deficiencies and provide a base line of guidance for the many countries that choose to use preventive detention, in a way that both respects human rights and maintains security. Diane Webber is a British solicitor who earned her doctorate at Georgetown University Law Center in Washington D.C. She has worked in London in private practice, focusing on criminal law (particularly white collar fraud), employment and discrimination law, and sports and entertainment law.